Closing Verses, the final event of Wordfringe 2009, featured a poetry reading by artists from Koo Press and the Blue Salt Collective — Catriona Yule, Haworth Hodgkinson and Douglas W. Gray. The trio called up imagery that drew from the immediate emotional and physical environment, as well as exotic distant lands. The show was hosted by Tarland's Left Bank Gallery — a Victorian villa turned modern gallery space — with its own impressive collection of visual art, and a delicious selection of cakes and antique tea to boot! Opening with the moan and patter of a sounded drum, Haworth Hodgkinson's poetry drew from the Northern coast he makes his home, calling up the 13 seasons, pulling mermaids from the sea, and desire from across six rivers. The poetry of Douglas W. Gray evoked scenes that touched on familiar physical and emotional landscapes — Aberdeen's Holburn Street and November Skies. Catriona Yule's work drew from a quiet and sensual internal landscape, as well as from the clamour and colour of physically remote destinations (Baghdad Blog and Day Trip to Cairo). One of the many highlights of the afternoon was Damages (Hodgkinson), penned while in Donegal, in which the three poet-friends delivered in hocket a puzzle-like verse from spatialized points of the room. This created a reverberant effect in which the poem appeared to bounce from the walls, as if inside a cave. The result was striking. Poetry readings allow the words to come off the page and into the ear, but this theatrical rendering took poetry to another level altogether — into a spatialized and suspenseful theatre. 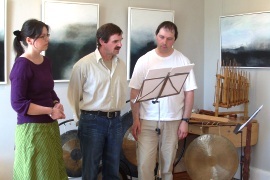 The entire programme was perfectly balanced with Hodgkinson's delicate musical accompaniment, supplied by an exotic array of instruments — from the Indonesian rattle to African djembe drum, to an impressive array of Chinese tamtams (gongs), which waited pregnantly on stage for most of the show, resonating passively with the boom of a poet's voice, until finally and violently sounded to accompany Hodgkinson's dramatic Stone to Ice. This whimsical afternoon tea-party appropriately marked the close of what has been a tremendous Wordfringe Festival 2009. Congratulations to all!